NEW YORK — More than 20 percent of American adults took at least one drug for conditions like anxiety and depression in 2010, according to an analysis of prescription data, including more than one in four women. 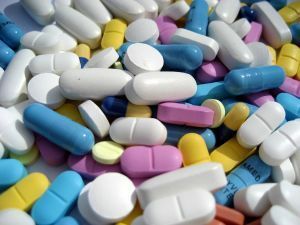 The report, released Wednesday by pharmacy benefits manager Medco Health Solutions Inc., found that use of drugs for psychiatric and behavioral disorders rose 22 percent from 2001. The medications are most often prescribed to women aged 45 and older, but their use among men and in younger adults climbed sharply. In adults 20 to 44, use of antipsychotic drugs and treatments for attention deficit hyperactivity disorder more than tripled, and use of anti-anxiety drugs like Xanax, Valium and Ativan rose 30 percent from a decade ago. The statistics were taken from Medco’s database of prescriptions and is based on 2.5 million patients with 24 months of continuous prescription drug insurance and eligibility. The company said women are twice as likely as men to use anxiety treatments, as 11 percent of women 45 to 65 are on an anxiety medication. Women are also more likely than men to take antipsychotic drugs like Zyprexa, Risperdal, and Abilify, which treat disorders like bipolar disorder and schizophrenia. However, among men 20 to 64, use of the drugs has quadrupled over the last decade. “There has been a significant uptick in the use of medications to treat a variety of mental health problems; what is not as clear is if more people — especially women, are actually developing psychological disorders that require treatment, or if they are more willing to seek out help and clinicians are better at diagnosing these conditions than they once were,” said Dr. David Muzina, a psychiatrist and national practice leader of Medco’s Neuroscience Therapeutic Resource Center. Pharmaceutical companies have also sought and received approvals to market their drugs to larger groups of people. Drugs for attention deficit hyperactivity disorder are prescribed to boys more often than girls, but adult women now take the drugs more often than men. ADHD prescriptions to adult women grew 2.5 times from 2001. However ADHD prescriptions for children have been declining since 2005. That reflects a decline in prescriptions for psychiatric and behavioral drugs for children. Medco found that prescriptions of those drugs for children have dropped since 2004, when the FDA warned they were linked to suicidal thoughts when used in people under 19. The company said less than 1 percent of children use antipsychotics drugs, although the figure has doubled since 2001. In the “diabetes belt” states of Tennessee, Kentucky, Mississippi and Alabama, about 23 percent of people are on at least one psychiatric or behavioral disorder drug. Diabetes is particularly widespread in those states and the condition is associated with higher levels of depression and anxiety disorders. The lowest rate of prescriptions was found in Indiana, Ohio, Wisconsin, and Michigan, where less than 15 percent of people are using those medications. Their shocking story came to light shortly after Nerissa’s death, when journalists discovered she was buried in a grave marked only by a plastic name-tag and a serial number. The date was 29 July, 1981, Prince Charles and Lady Di’s wedding day, and as the Queen arrived at St Paul’s Cathedral and waved to the crowds, two women in late middle-age, in shapeless, baggy dresses, shuffled with clumsy gait up to the television and waved and saluted back to her, unable to articulate speech but making excited noises. The two women were Nerissa and Katherine Bowes-Lyon – nieces of the Queen Mother and first cousins to the Queen – who had been incarcerated since 1941 in the Royal Earlswood Asylum for Mental Defectives, at Redhill in Surrey. Their last reported visitors were in the 1960s, and although it was an open secret at the Royal Earlswood, and in the local community, that the asylum housed close relatives of the Royal Family, to the wider world their existence had been obliterated. Burke’s Peerage had declared them both to be long dead, on misinformation supplied by the family. In fact, Nerissa did not die until 1986, aged 66, and Katherine is still alive; at 85, she is the same age as the Queen. The ensuing scandal, which prompted an anonymous source to provide a gravestone for Nerissa, made little difference to her sister’s life. Katherine received no visitors at the asylum, and as her aunt, the Queen Mother, lived on into cosseted old age, she did not possess even her own underwear – at least untilher final years there – and had to dress from a communal wardrobe. Now a Channel 4 documentary tells the story of the Queen’s hidden cousins, born in an era when children with learning disabilities were a family’s shameful secret. Photographs of Katherine Bowes-Lyon show a distinct resemblance to the Queen, and Onelle Braithwaite says the sisters’ story was common knowledge when she arrived at the asylum as a 20-year-old nurse in the mid-1970s. 1966, by the girls’ mother, Fenella. 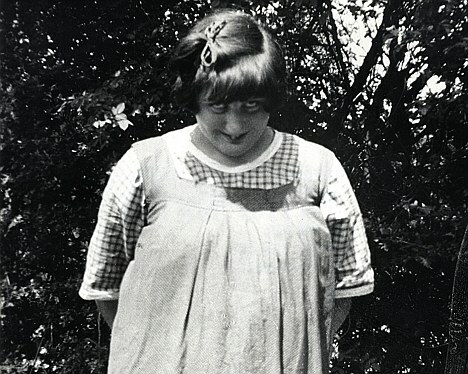 The sisters were unfortunate to have been born in an era when mental disability was seen as a threat to society and linked to promiscuity, feckless breeding and petty crime, the characteristics of the underclass; associations encouraged by popular belief in the science of eugenics, soon to be embraced by the Nazis. ‘So the belief was if you had a child with a learning disability, there was something in your family that was suspect and wrong,’ explains Jan Walmsley, the Open University’s professor in the history of learning disabilities. Judy Wilkinson, 67, from Godalming, Surrey, recalls her apprehension when visiting the Royal Earlswood as a young girl in the 1950s, when her elder sister Nicola, who was brain-damaged at birth, was consigned there. ‘I’d get that gripping feeling of dread,’ Judy explains, and she remembers feeling puzzled that her sister was always wearing the same green coat, which never seemed to wear out. From the late 1960s, a wave of scandals exposed conditions in institutions that were severely understaffed and overcrowded. The Royal Earlswood was closed in 1997; at least one former nurse has alleged patients were abused. The grandiose building has since been converted into luxury apartments, while Katherine is believed to be living in a care home in Surrey. Her relationship with her family remains unchanged. The email sent to police officers by a senior officer at Holden Hill. SA Police deny officers were ordered to meet quotas and say the email was a ‘mistake’. POLICE were ordered to meet quotas for the number of arrests, drink driving reports, traffic and drug offences in a five-week period, an internal police email shows. 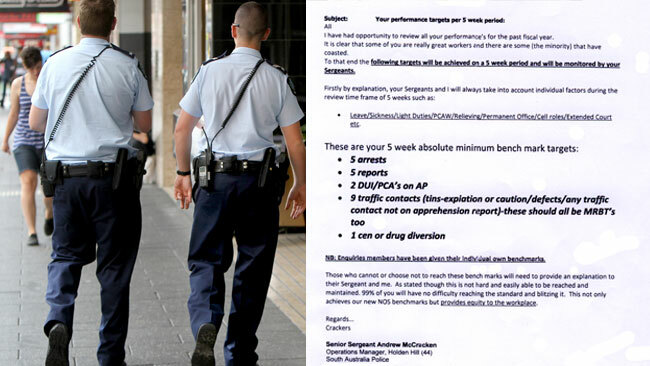 The Advertiser has obtained the email, from Holden Hill Senior Sergeant Andrew McCracken to patrol officers on July 28, which listed five benchmark categories including the number of fines, reports and arrests each officer must obtain over five weeks. Officers who did not meet the benchmarks would be required to provide “an explanation” to Sen-Sgt McCracken and their immediate supervisor. Senior police now say the email’s directions were “outside of SAPOL’s guidelines and policies” and it had been rescinded. MAKE five arrests and reports. ARREST or report two drink-drivers. MAKE nine traffic contacts, including on-the-spot fines, using mobile breath tests. ISSUE one drug-related fine or diversion (for minor illegal drug possession). The email also said “a minority” of officers at the station had failed to reach the targets during the previous 12 months because they had “coasted” in executing their duty. “It is clear some of you are really great workers and there are some (the minority) that have coasted,” the email said. “Those who cannot or choose not to reach these benchmarks will need to provide an explanation to their sergeant and me. The email was rescinded on August 2 when local police management were advised. Police initially told The Advertiser it was rescinded within 24 hours of being sent. Opposition police spokesman David Ridgway said the email showed contradictions in the messages coming from SA Police. “It flies in the face of what we’ve been told – that there aren’t quotas for a whole range of activities. If police are putting these things in emails, then clearly there is a view within SA Police at certain levels that they do have quotas and that’s why this person has published that,” he said. Mr Ridgway said setting benchmarks or quotas could compromise police duties. “I would’ve thought it would distract them from making sure they are providing a whole community policing approach when they are having to focus on particular benchmarks,” he said. “If they need a drug bust and they haven’t had one, do they forget about every other offence and just go and look for a drug issue? Holden Hill local service area officer-in-charge Superintendent James Blandford said the email was a mistake. “It is important to note the email was sent to operational staff within the Holden Hill LSA only,” he said. “The original email was sent by an officer who was relieving in a higher position. The directions given were outside of SAPOL’s guidelines and policies. “As soon as local management became aware of the email, it was rescinded.” He said SA Police made no secret of the fact benchmarks were set for traffic contacts but this was in no way linked to revenue. He said almost 30 per cent of traffic contacts ended in a caution. Police would not elaborate on exactly what other areas had set quotas. “Benchmarks exist across SAPOL for a number policing duties, including responses to emergency calls and requests for police assistance,” Supt Blandford said. Police Association of South Australia president Mark Carroll said any confusion on quotas had to be addressed immediately. “SAPOL management has expressed publicly that it does not have, nor does government expect, booking quotas,” he said. Prague, Nov 16 (CTK) – The Knights of the Cross with the Red Star order has uncovered a new relic of St Agnes of Bohemia (1211-1282), a part of her hand’s bone, which will be displayed at a large exhibition on her life in Prague, Marek Pucalik, a co-author of the display, told reporters Wednesday. 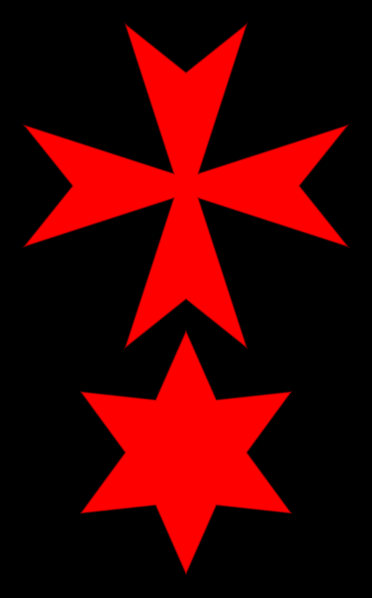 The Knights of the Cross with the Red Star, the only religious order originating in the Czech lands, was established by Agnes of Bohemia, a princess of the House of Premyslids who opted for a life of charity and piety, in the 13th century. Pucalik said the Clarisses, nuns of the Order of Saint Clare (whose first convent in Prague was founded by Agnes of Bohemia) had held the relic. Then it was moved to Vienna where it stayed until the 1990s and later it was transported to the Czech Republic, he added. Pucalik noted that the authentic character of the relic was confirmed by the church administration and not by researchers. The exhibition entitled “St Agnes of Bohemia – Princess and Nun” will be opened at St Agnes Convent in the Old Town of Prague next week, as a culmination of the St Agnes Year celebrating the 800th anniversary of her birth. The exhibition will offer about 300 exhibits, including some items loaned from abroad. The unsuccessful search for St Agnes’s bodily remains in Prague’s Hastal Church last February drew attention of the public and the media. A relic is the remains of a saint as well as other items associated with his/her life, such as a piece of clothes or other personal belongings. So far the only known relic of St Agnes of Bohemia has been a lower jaw preserved in the collections of the Escorial royal chateau near Madrid. Spanish King Juan Carlos donated the last tooth from the jaw to the Knights of the Cross with the Red Star in Vienna in the 1990s. The St Vitus Chapter in Prague received a part of the bone after a request by Czech Cardinal Frantisek Tomasek. However, the origin and genuine character of the relic is being questioned. Pope John Paul II canonised Blessed Agnes in November 1989, a few days before the Velvet Revolution that prompted the fall of the communist regime in Czechoslovakia. Catholic believers therefore connect St Agnes with the restoration of freedom and democracy in the country. A pilot who accidentally locked himself in his airplane’s toilet caused a terror scare when he asked a passenger to bang on the cockpit door to raise the alarm. Fighter jets and the FBI were alerted. 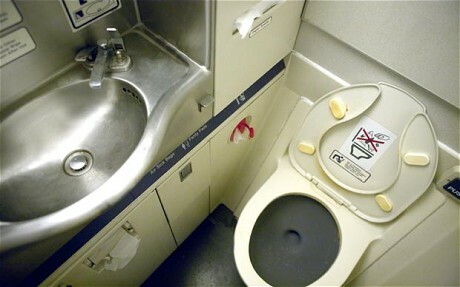 The captain of Chatauqua Airlines flight stepped into the toilet shortly before landing at New York’s LaGuardia airport. But as he tried to step out the door jammed, leaving him stuck shortly before the jet was due to touch down. He banged on the door of the toilet to try and summon help and to his relief a passenger came to the door, the New York Post reported. The stranded pilot gave him a password and told him to go the cockpit and explain the situation but the sudden knocking and the unknown voice caused a panic at the aircraft’s controls. His co-pilot immediately radioed ground control to warn them that someone “with a thick foreign accent” was trying to get into the cockpit. “We are 180 knots 10,000 [feet], can we leave the frequency for a minute? We are going to try to, uh contact dispatch,” he said. The co-pilot advised him to declare an emergency and land the plane, while fighter jets and the FBI were alerted. Fortunately, the captain managed to extricate himself shortly before landing. Marijuana could soon be legalised in Copenhagen, after the city voted overwhelmingly in favour of a scheme that would see the drug sold through a network of state-run shops and cafes. The scheme, if approved by the Danish parliament at the start of next year, could make the city the first to fully legalise, rather than simply tolerate, marijuana consumption. The drug is already sold openly on the streets of Christiania, a self-proclaimed ‘free town’ in the city centre, despite the closure of the neighbourhood’s Amsterdam-style coffee shops in 2004. But marijuana has never been officially decriminalised and those caught in possession of even small amounts face fines of up to £450. The City Council voted on Thursday night, by a margin of 39 votes to nine, to empower Mr Warming’s Social Affairs committee to draw up a detailed outline of how the plan would work. The proposal will then be sent to to the Danish Parliament for approval early next year. “We want to make it a little bit more concrete what kind of decriminalisation we want: should it be a public buying system, should there be an age limit?” Mr Warming explained. He said he was opposed to instituting cannabis cafés, where marijuana use is tolerated, despite it remaining illegal to grow and import the drug. This, he argued, would leave the revenues, which are estimated at £200m, in the control of the city’s notorious biker gangs. “We don’t want an Amsterdam model. 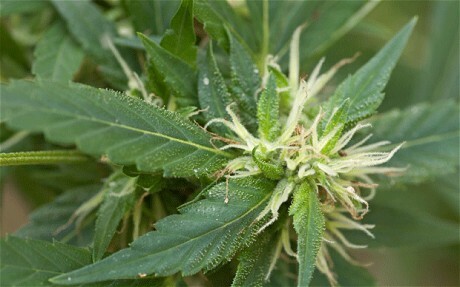 We want a way to make it legal to import or grow marijuana.” he said. Cannabis possession and production in the Netherlands are still technically punishable by fines. Its notorious coffee shops are also illegally but are tolerated. The Danish parliament voted down a previous proposal submitted by Copenhagen City Council three years ago. A frigid Arctic air mass, unusual even by Alaska standards, is dropping the mercury in the state’s interior to unheard of levels in mid-November. Stunningly low temperatures in the -35 to -50 range have gripped the region since Tuesday. These temperatures are some 25 to 40 degrees colder than average. This morning, Fairbanks airport dropped to 40 below zero, breaking the old record of 39 below. That’s after setting a record low of 35 below Tuesday morning, breaking the old record of 33 below from 1956. Wednesday’s low of -39 just missed 1969’s record of -41. Eielson Air Force Base in Fairbanks dropped to an incredible 42 below Wednesday morning, shattering the old record of 37 below set in 1956. This morning, it dropped to 42 below again, setting another new record low. The average low is -7. A diifficult to imagine -49 degree reading was measured unofficially at UAF Smith Lake Wednesday, and, according to the National Weather Service (NWS), infrared satellite imagery sensed 50 below readings in the coldest valley locations. As cold as low temperatures have been, high temperatures haven’t been much warmer. Fairbanks only gets about six hours of daylight this time of year, limiting the opportunity for the sun to moderate temperatures in the aptly named “Land of the Midnight Sun”. Yesterday’s high at the airport was just -28 compared to an average high of 10.